With the groundbreaking of the new Terminal C facility for Delta Air Lines and ongoing work on Central Terminal B, Governor Cuomo’s vision for a single, unified LaGuardia Airport is becoming a reality. HOK’s master plan team, including WSP, is supporting the governor’s vision with advisory, implementation and master design criteria services to ensure visual continuity and transform LaGuardia into a fully connected airport. With over two million total square feet of new terminal space being constructed, this represents one of the most significant airport redevelopment projects in New York State in more than 20 years. Working with the Port Authority of New York and New Jersey along with Delta Air Lines and other airport stakeholders, HOK’s team developed a path for integrating the long-term redevelopment of airport facilities while ensuring high-quality design. The prominent roofscape introduces a unifying canopy and defines a continuous edge that integrates the new structures with the existing garage and adjacent support facilities. In the heart of the new airport, Central Hall will provide a grand entry point for arriving passengers by car or potential future AirTrain stations while linking Terminals B and C. Both terminals will feature soaring ceilings, abundant natural light, world-class retail and concessions, and intuitive wayfinding. With similar headhouse massing and architectural details to create visual connectivity, the new terminals will be situated closer to the parkway expanding airport taxilanes by more than two miles. Extensive airfield improvements such as dual and loop taxilanes and gate flexibility will help the new LaGuardia Airport function efficiently into its next century of service. 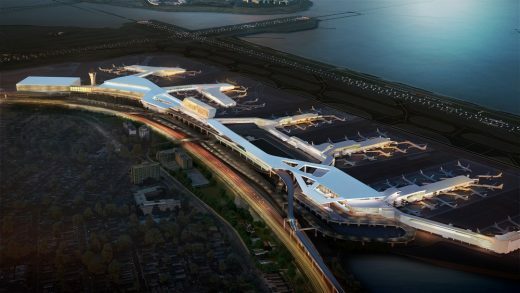 The LaGuardia Gateway Partners’ joint venture of HOK/WSP is the architect and engineer for the 35-gate Central Terminal B and Central Hall. HOK is a global design, architecture, engineering and planning firm. Through a network of 23 offices worldwide, HOK provides design excellence and innovation to create places that enrich people’s lives and help clients succeed. DesignIntelligence consistently ranks HOK as a leader in sustainable, high-performance design and technology innovation.